I'm fully on the bandwagon of using home screen shortcuts on iOS. The Automators podcast had a nice discussion about the pros and cons. 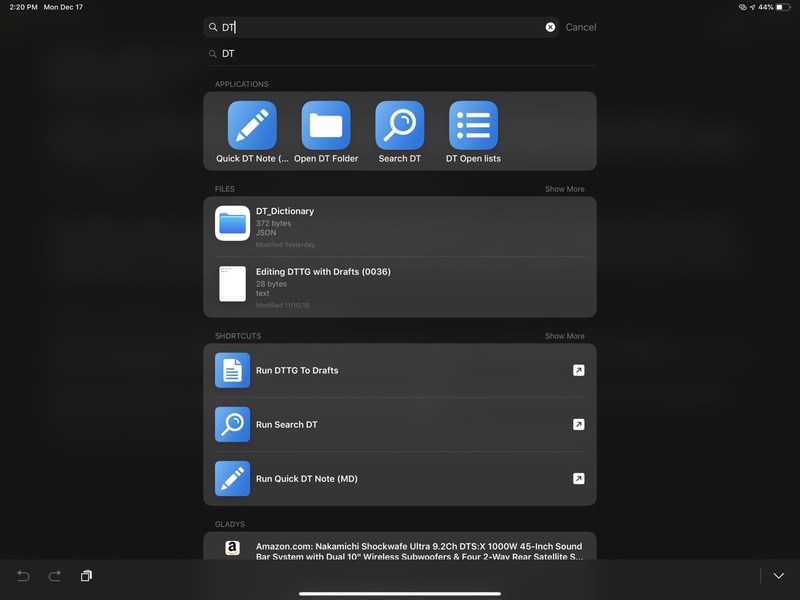 Coincidentally I've been using a folder on my dock for iPad to get to my most commonly used OmniFocus, DEVONthink, Day One, and Fantastical screens. At least these shortcuts still work as expected so I'm sticking with them. While I like working in all of these apps, all of my shortcuts are workarounds for navigation limitations in the app UIs. For OmniFocus I have two Shortcuts that jump to my most commonly used project views. I also have two Shortcuts for adding tasks. 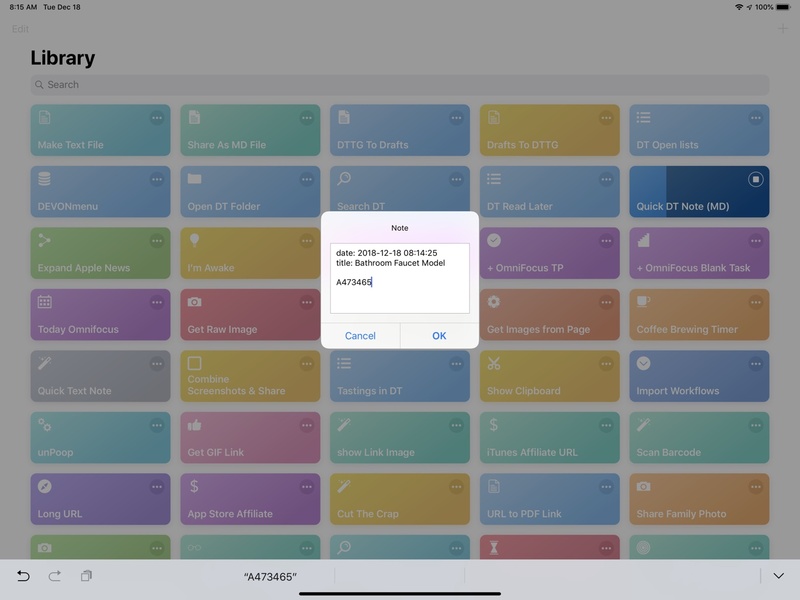 One shortcut opens a text box and accepts TaskPaper formatted text for creating tasks in OmniFocus and the other starts an OmniFocus task using the Shortcuts entry screen. Both of these shortcuts are much easier to use than the built in OmniFocus task creation screen. Creating the desktop shortcuts is easy. Just open the options for the shortcut and tap the "Add to Homescreen" link at the bottom. It's a little awkward, but Safari will open with instructions on how to add the shortcut to the iOS "desktop." Unfortunately there is no option to add the shortcut to specific folder. These Homescreen shortcuts also do not sync across devices. I originally started this dock folder for DEVONthink shortcuts that I use daily (if not hourly). 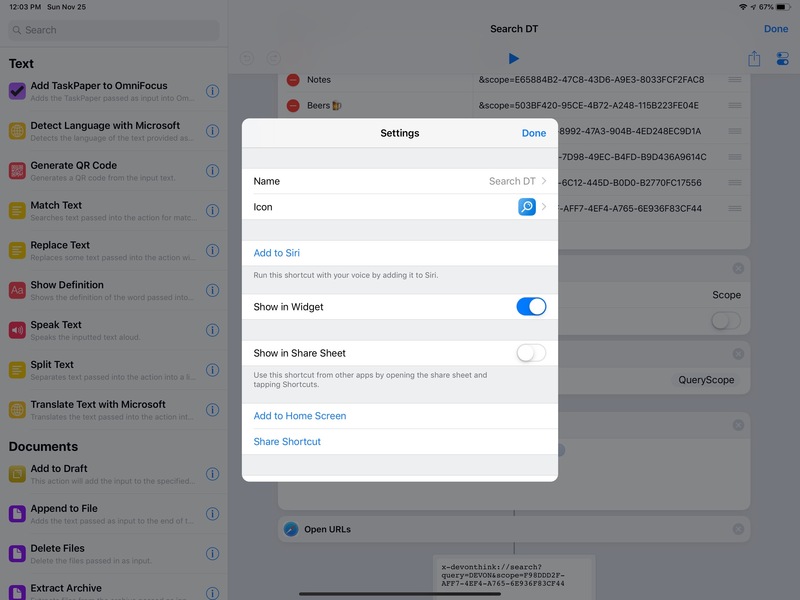 One shortcut starts a custom search in DTTG. The big trick here is that the shortcut gives me the option of limiting the scope to my most commonly used groups and databases. This saves me a few taps in the app and gives me better search results. Another shortcut opens a text input field and then creates a note file in DEVONthink. It saves me a few seconds and some mild annoyance that would otherwise keep me out of DEVONthink. They are "shortcuts" in the truest sense. The real power here is that they are all in my iPad dock. On my iPad I can hit CMD-Opt-D to bring up the dock. Or, I can hit CMD-Space to start a Spotlight search. Here's where naming Shortcuts with searchable names really pays off. 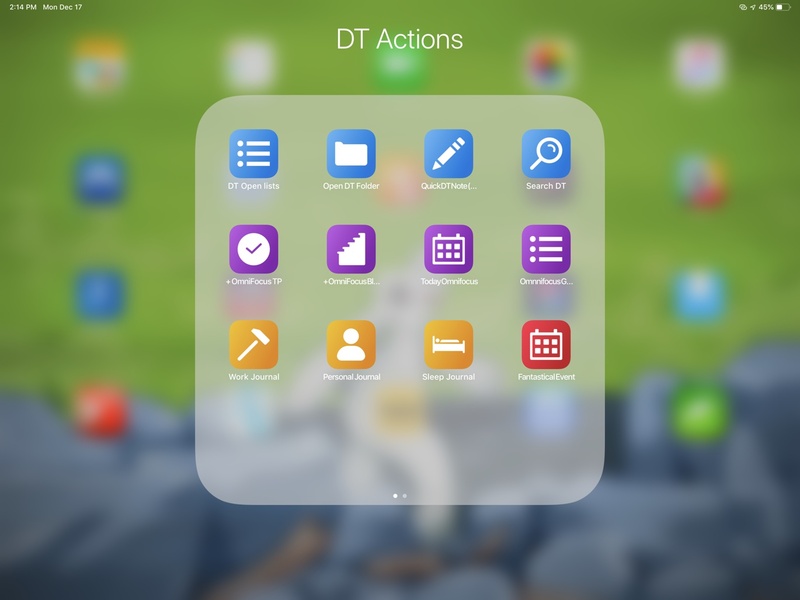 "DT" is an excellent way to quickly launch my DEVONthink shortcuts. As a tip, you can use the arrow keys on an iPad Pro Smart Keyboard to navigate the results in a Spotlight search. Hit Return to run it. DEVONthink sync continues to improve, with last week's update rolling out push-sync between devices. In my experimentation this is a very nice improvement for anyone running DEVONthink across iOS and macOS devices. This is how it works for me. Speaking of independent Apple blogging, it's nice to see that Thomas Verschoren is back at it. While I'm frustrated by some of Shortcuts gaps, it has solved some long standing problems. I use apps like Drafts less because I can do basic clipboard transformations with Shortcuts, triggered by Siri. Here are a few the clipboard Shortcuts I use the most.